Add contemporary style and color to your furry friend's daily mealtime with the Platinum Pets Modern Double Diner Elevated Wide Rimmed Pet Bowls. This classic design features a wrought iron stand in a sleek, minimalistic design, while the elevated feeding position helps ease neck and back strain as well as improving digestion. 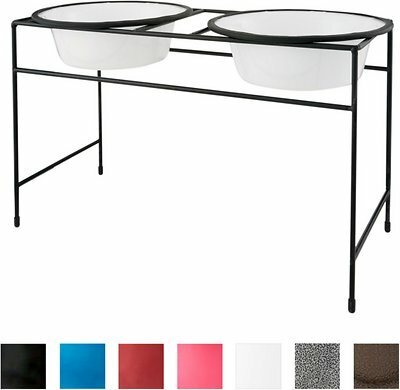 The wide-rimmed bowls fits snugly in the stand and everything is powder coated for long-lasting safety and durability. The wide variety of colors complement any personality or décor for a truly unique and memorable dining experience. Wrought iron stand features a simple, modern design that blends seamlessly into any décor. The wide-rimmed bowls fit snugly in the stand and feature rubber gaskets around the edges to keep them from spinning in the stand and help reduce noise. High-quality powder coated finish on both the bowls and stand prevents chipping and cracking for long-lasting durability. Elevating your pet’s bowls help reduce neck and muscle strain, and also provides a more natural feeding position that helps improve digestion. Available in five sizes and a wide variety of cool colors to match every style and décor; refer to the “Size” tab for dimensions and capacities. While I ordered the wrong size which was on me, I have already placed another order for the extra small ... I recommend that size for normal sized felines ... I do like the quality for both the bowls and the sturdiness of the design. I cannot wait to get the right size. I know since my cat is getting older it will be much easier than his current set which he has had since he was a kitten. It just requires him to bend down so I figure a set that doesn't would be better on his joints and his digestion. Winner, winner, chicken kibble dinner! I didn't think having these bowls would have such an impact, but honestly they're so worth it. Sturdier than they look, they are basically noise-free during mealtime (except for the chewing and lip-smacking), hold enough food (we have a M-L dog), are easy to clean (I don't even put them in the dishwasher, I just hand wash after every meal and they just wipe clean) and best of all, allow for easier digestion because they are elevated. The stand is a bit too high for my golden retriever so he prefers eating his food and drinking water on the ground. The bowls are cheaply made and made of plastic with rubber around the rim which can be pulled off by the dog. I guess for the price, it's good. My dog likes playing with his bowls which made him spill water constantly & I wanted something for when he got bigger so he didn’t have to strain his neck bending. I love this set, it’s simple & looks great. Mac cannot tip or remove the bowls to spill any food or water so it’s been very helpful! Only took a minute for my boxer to realize his food and water was at an easy to reach height, no more floor level. What I loved was the next morning when I went to let my 2 dogs outside---no food spilled due to the other dog. No more wasted food. This does the job, but the bowls should be larger. It is way over-priced for a couple plastic bowls and a wire rack, but it seems to keep the food fairly safe. I did have to sit the legs in water to keep ants away. Very cheaply made. They are great for my two six pound Yorkies. It fits their daily food portion in the bowls perfectly. The bowls stay in place because of the rubber trim. The stand also stays in place because the ends of the stand have rubber trim. I also think that the height is good enough for them to avoid any neck strain when eating. I believe I had ordered the x-small size bowls set. I thought I purchased the white ones but turns out I didnt click save and ended up getting the Silver vein ones and I couldnt be happier with the mistake! They definitely look different than they do in the picture, they actually look better in person! I recommend this color for darker gray/black kitchens!